Tags: guru, rama, rama nama, sabari. Once upon a time, in a forest, there lived a woman by name Sabari. She wandered about the forest, ate whatever she came across and lived more like an animal. One day, she happened to pass by a place in the forest where she experienced untold peace and happiness within herself. She didn’t know what caused it though. As she stayed there, her perception towards everything slowly changed. She started to admire the beauty of nature and developed a sense of kindness towards all animals. She wondered about the reason for the dramatic change in herself. Then she saw a holy person coming out of a nearby cave along with his disciples. He was a great mahatma, Matanga Maharishi. She realized that the change in her was because of his presence. She then began to serve him quietly by removing stones and thorns from the path to the river that the mahatma took everyday. When the Maharishi came to know of this, he called Sabari and blessed her. Sabari was filled with joy to meet her Guru and continued to do her service happily. A few days later, there was a lot of hustle and bustle at the sage’s ashram. Sabari was told that Matanga Maharishi was going to ascend to the heavens. Hearing this Sabari was heartbroken. She went running to her Guru. There the sage was blessing all his disciples with whatever they wanted. When the sage asked her what she wanted from him, she broke into tears but said humbly admitted she did not know what she wanted. She requested her Guru to bless her with whatever he deemed good for her. Hearing this, Matanga Maharishi was very pleased. 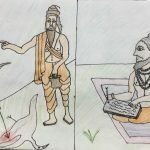 He had been disappointed that none of his other disciples had asked for the most valuable treasure that he had in his possession: the Rama nama. Now the sage, out of his immense compassion and love for Sabari, gave her the Rama nama. When she asked him what it meant, he told her to chant it constantly and that one day the essence of the mantra would itself land at her doorstep! Years passed, Sabari became very old, but her dedication never wavered. She continued to chant Rama Nama and waited patiently for Lord Rama. She knew He would come, because her Guru had said so. Tirelessly she picked the best fruits daily, tasted them to make sure they were indeed fit to be offered to the Lord and kept them ready for Him. Finally, Sri Rama and Lakshmana came to her doorstep and she had Their darshan, just as her Guru had promised. Her purpose in the world was complete. In the very presence of Sri Rama and Lakshmana, she gave up her life and went to her Guru’s abode. Thus, Sri Rama and Sri Lakshmana witnessed her moksha. 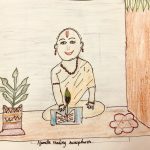 One Response to "Sabari's Guru Bhakti"